This is the new feedback thread. ALL forum-related comments are to go in here, both technical topics and those related to moderation. Please bear in mind that once we say a topic has ben discussed enough, that is the end of the forum debate. Further inquiries may be made via email ONLY. This thread is not the place to bring offensive posts to our attention. That is what the report button is for. This could be a case of my own naivety, but I'm wondering why my signature isn't showing up on my posts? I made it and submitted it in the User Control Panel, and it shows in my profile. Any ideas? Everything is set to disabled, I'm just clearing it with the boss exactly what I can switch on and then things will appear. Would prefer it if it was fixed width rather than 100% width, on a large screen it looks ridiculous. Very 1999. That I believe is a platform feature rather than a conscious choice. On another point, registration dates have been kept, so sorry to those I told otherwise! Is it just me who feels that this new look forum looks incredibly faster? any chance we can have a sub forum for the driver support threads. on the main page. We have most of the first page taken up of driver threads. Any chance of a 'Quick Reply' form at the bottom of topics? It may be a conscious decision to not have one, in which case I don't mind, but otherwise great job folks! Edit: But the shortcuts for them have! No more ':d'...one of the quirks of the old forum haha. Can see here on the W.
That's a scale issue, not a site problem. I reeeeally dislike it. It definitely needs to be fixed width because it looks awful stretched across my screen. Good overall impression of the new forum. However, there is something I don't like: there are some white texts on a light grey background ("Members" pages) and also some dark red texts on a dark grey, nearly black, background (Main page, up right corner) which are difficult to read. Signatures work - they have just been deleted. I've just recreated mine. Might I request the particulars of the person or persons responsible for importing the classic PF1 smileys that they be formally recommended for Royal consideration, to wit, that they be bestowed a high Honour by the grace of Her Majesty the Queen (long live the Queen!). I'm sure Tim will be overjoyed that you nominated him for such a high accolade for a bunch of faces! I would prefer a fixed width of posts. Other than that good work bodyrockers! And just look how happy I am! Nice job moving to phpbb! Much better! I personally think you should enable avatars, but only allow personal headshots so we could see who we are typing at. Forum title is "planetf1.com &bull; Index page" can we get something better? It looks ugly in browser. Really like this new layout! Glad you finally made the move to something more modern! A couple of things - not sure if you guys can do anything to fix them. 1. When you go into a topic and tehn click the back button to get back to the forum menu, it doesn't clear the unread post icon from the thread which it used to do on the old one. You need to go up to the top of the page and click on the "F1 Forum" next to the Board index to get it to clear when you are in the forum menu. Not a big thing but it is a little annoying to have to scroll all the way up to the top to go back or not know if there are any new posts on a thread. 2. Clicking inks opens them in the same tab, replacing PF1. It was better when links would open in a new tab. Pretty small gripes considering the benefits of the new format, but thought I would mention them in case there was an easy fix on your end. I see no 'post topic' button anymore. Avatars (even if just the ones you have to link rather than upload) and topic reply notifications would be nice. Does it help to tick "Automatically log me in each visit" before you login? This kind of problem where someone is logged out every now and again is usually because their IP address changes. A Google search reveals lots of information about this kind of thing. - I prefer flexible width. Maybe just setting Max/Min width & auto adjusting within the limits could do the job for both sides. - I can't find an option for posts per page? 40 posts per page are too many for me and pages with lots of quotes tend to get very long. - Clicked "Mark topics read", nothing seems to have changed. Color / bolded titles look the same. 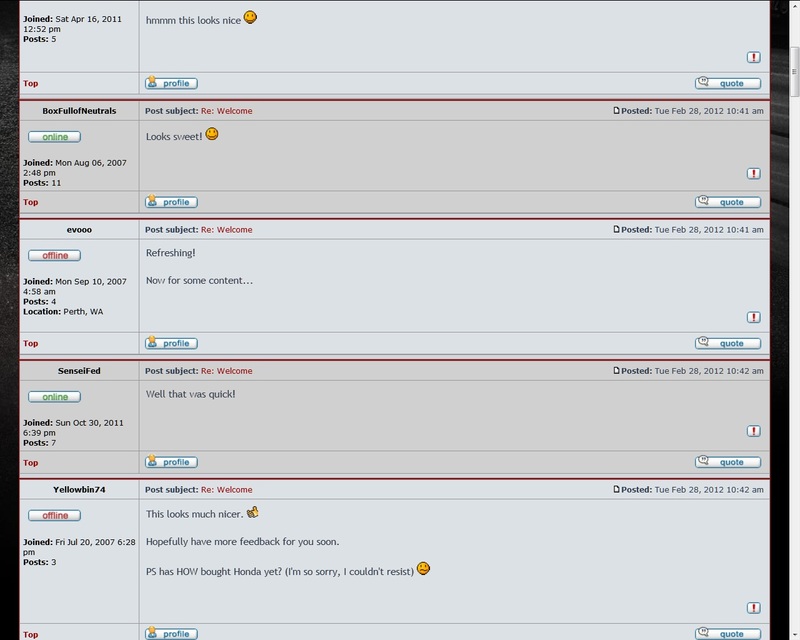 - A minor one, slightly larger font size for "Board index » F1 Forum" would make it easier to navigate. Last edited by seesaw on Wed Feb 29, 2012 2:05 am, edited 3 times in total. Yes, but scaling up makes the whole forum very big (Like for people who have poor vision) for example one click zoom in makes all the text bold, and it makes the smilies to a low quality. Checked on four different computers and it's either hard to see text or bold when setting the scaling. It don't bother me overall but is not very versatile.